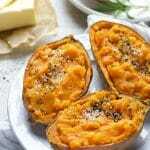 Baked Restuffed Brown Butter Sage Sweet Potato, the perfect side for your holiday meals! Pre-heat oven to 375F degrees. Place potatoes on a rimmed baking sheet and prick each with a fork. Bake for 50 mins or until fork tender. When the potatoes are done, remove from oven and allow it to cool down to touch. Then slice the potatoes in half, the long way and set aside. Meanwhile melt the butter in a large casserole. Stir the garlic in the butter for 1 minute. Add the chopped sage to the garlic butter and continue stirring the mixture for 2-3 additional minutes, until the butter has turned very light brown and has a rich, nutty aroma. Season the sage brown butter sauce with ground black pepper. Scoop out most of the sweet potato leaving just a thin layer of skin behind. Transfer the mashed sweet potato into the brown butter sage and fold to combine. Restuff the sweet potatoes with the brown butter sage mashed sweet potatoes. Top with black and white sesame (or other topping of choice) and serve.